Reciprocating saws are a great tool item for any working man or woman, whether they practice home improvement as a hobby or are part of a contracting team for their career. First invented in the early 1950’s, this type of saw now comes in many varying weights, sizes, abilities and aspects. You can purchase a cordless reciprocating saw, which will allow you to take it with you to any site, no matter how far. But you might go with reciprocating saw accessories. The saws are efficient as well, due to their customization of blade you can cut through virtually any material with it. They are easier to use than a manual saw and have a comfortable grip. The saws can also be used for multiple purposes, such as sanding, detailing and scraping. With all of these positive characteristics, you would think reciprocating saws come with a hefty price, but the saws are actually affordable. Basic reciprocating saws without accessories can cost as little as $40-$50 where professional grade models may be as much as $200 (but typically these models include lots of accessories, back-up batteries, and attachments). If you are looking into purchasing a reciprocating saw, consider buying accessories that may or may not come included along with it. Listed below are several important attachments and extras to help make the experience with your new reciprocating saw an easy and safe one. 1.1.1 What You Need box or bag? It is important to buy some safety accessories to go with a reciprocating saw, especially if this will be your first time using the tool. 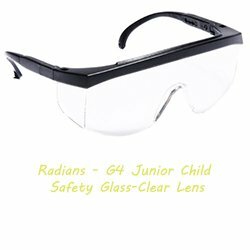 Keeping your hands and eyes protected when working with woods or metals will ensure no fragments cut or scrape your skin or sensitive corneas. We will explore most essential items you need before using a reciprocating saw. The products reveal the best quality and low cost – all of these accessories combined should cost no less than $90 and no more than $150 depending on which attributes you value in each product. The initial need for your new tool is something to carry it around in and protect its condition. Some reciprocating saws will come with a tote or bag of some kind to keep it safe from damage and make it easy to transport. If you happen to find one you like enough to purchase that doesn’t include a bag, there are plenty of inexpensive options for your new saw. Flexible platform allows different combinations. All units can stack on top of each other, connected with durable side latches. Heavy-duty metal latches and hinges. 1-Click Stacking - easily lock tool cases together for easy transport and handling. Top, front and side handles - 3 carrying options for comfort in all situations. Durable - shock proof (fully crash tested) and water resistant material. Interlocking latches secure lid shut and link multiple cases together. Corresponding channels along lid and base of case for stable, non-shift stacking. Low-profile, rounded carrying handle for user comfort. Buttressed Hinges - For Jobsite Durability. What You Need box or bag? First, decide what is more important to you – storage space or organization. Tool bags tend to have more volume for you to put your items in, reciprocating saw included, while tool cases are typically made out of a hard plastic and feature two or more compartments allowing you to divide your tools up. 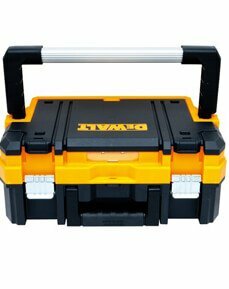 A good example of a well-rated and affordable tool case is the Dewalt Long-Handle Toolbox Organizer. With over 500 reviews and near-perfect rating, many hard-working men and women have trusted this item and found great use from it. They enjoy the ability of the case’s compartments to be easily removed from the case itself – allowing the worker to transport just the bare necessities from one place to another. That case can cost anywhere between $20-$30. If you prefer something with a strap and more room, and a little less organization doesn’t bother you, look into tool bags. Black and Decker sells the Matrix Wide-Mouth Storage Bag for the same cost as the DeWalt tool case but features an adjustable shoulder strap. The strap will make toting your tools around more comfortable for you. It’s also larger than the tool case, offering up to 21 inches in length of space almost any size or model of reciprocating saw will fit. Customers love its durability and exterior pockets for easy access to items. 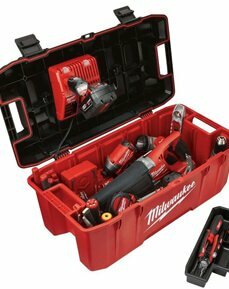 Some brands, such as Milwaukee, produce tool cases designed specifically for reciprocating saws, such as the M 18 Fuel Heavy Duty Tool Case. Made from a durable plastic, this case claims to be the perfect amount of space for your reciprocating saw and based on reviews, that claim holds up. The case is around $120, making it a large purchase for some, but it a good investment for those looking to keep their saw safe and in factory condition. A popular choice for gloves is the long-running, trusted brand, Carrhart. Their Ergo Knuckler gloves feature nylon and rubber textures with indention to help with grip. The Ergo Knuckler gloves are breathable, ensuring your hard work doesn’t lead to sweaty, slippery hands. They have raving reviews, stating they’re comfortable, have a great grip, and perfect fit. The gloves cost around $13. However, if searching for something to wear specifically when utilizing a reciprocating saw, mechanics gloves might be better suited, such as the Bob Dale mechanics gloves. People feel safe in some gloves, so they reviewed and recommend them highly. Padded knuckles provide protection against bumps. Wing closing strap for easy-on, easy-off. Stretch spandex for flexibility and fit. Form-fitting TrekDry helps keep hands cool and comfortable. Seamless single layer palm improves fit and dexterity. 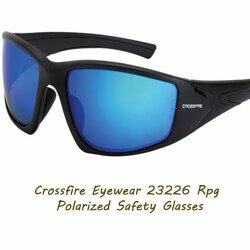 Reinforced padded palm provides superior toughness and comfort. Neoprene knuckle strap provides extra dexterity. Breathable neoprene between fingers offers improved flexibility. The knit wrist helps prevent debris from entering the glove. Form fit and feel reduces hand fatigue while providing enhanced comfort. Excellent gripping in a variety of applications. The Bob Dale brand produces several kinds of working gloves, all geared towards different needs, such as rancher’s gloves, climbing gloves, and operator’s gloves. Their range of options for blue-collar workers shows they are a dedicated and trusted source with lots of knowledge of the field. The Bob Dale mechanics gloves are a synthetic leather and cotton mesh of fabric, making them breathable and offering stretch. They are best for work involving a reciprocating saw because they have the ability to absorb shock, alleviating your body from the vibrations of the saw. The Velcro band at its wrists allow for a safe, perfect fit around any size wrist. They cost around $20. 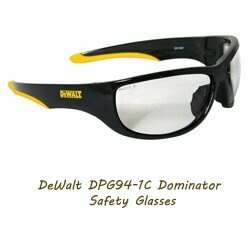 DeWalt is another brand that working men and women trust to produce quality products that always have safety and efficiency in mind. 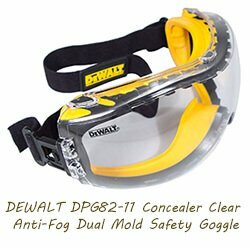 The company’s safety goggles feature an adjustable strap, allowing for a great fit and ensuring comfort for long wear. The lens even provides UV protection for those projects on hot summer days. The goggles cost around $10. 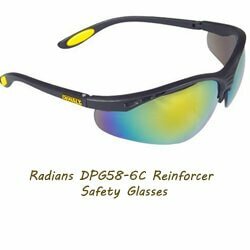 Theses Goggles will play an important role in the time of work with power tool, specially we recommend these as reciprocating saw accessories. 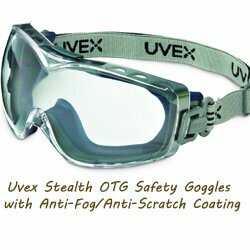 Because these goggles are made to protect the eye from any kind of dust which extracted from your project. Spyder is a well-known brand for distributing kits that come with multiple accessories, giving you and your saw the edge you need to get any job done. 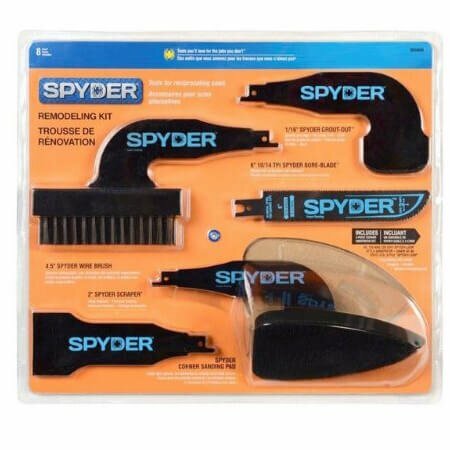 Featuring five different attachments, including a brush, three different scraper sizes, and a detailer saw, the Spyder kit is well-received because it can fit virtually every reciprocating saw and gives its user the ability to do more with their tool. The kit costs around $30. Other helpful attachments that may be additionally purchased are scouring pads, useful when cleaning hard-to-remove grease from grills, or grout rakes, making removing unwanted grout from in between tile easy. An important tactic in maintaining your saw is to charge it regularly and to keep your blades clean and dry. Rust or oxidation of the metals can damage the utility of your reciprocating saw. Never wear down your saw. If you experience grinding or the saw isn’t running as smoothly as it once did, look into replacing any of the products listed below. Having these accessories as back-ups with you will ensure that your saw is always in top working condition. A great way to keep your reciprocating saw working like new for years to come is to invest in blade holders and clamps. They are bought as kits, featuring several small parts, all to help with restoring the quality and utility of your saw. Know the brand and model of your reciprocating saw before shopping for these items as they are sometimes made specifically. 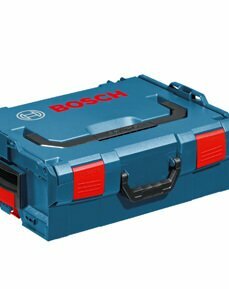 For instance, BOSCH brand produces a clamp kit that only works for BOSCH brand reciprocating saws. Charging regularly may lead to the necessity of a replacement battery. Most saws will come with a lithium battery, others will include an extra one or two. Purchasing batteries that are made by the same company as who makes your reciprocating saw may be the best choice, as, often times, the saws have varying sizes and some batteries may not fit. However, there are some companies catering to the market by generating 100% compatible batteries. 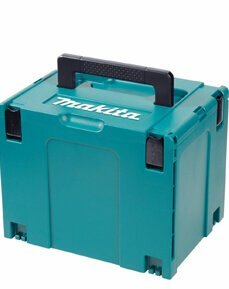 Such is the case with the Makita 4390D replacement battery, which comes with a one-year warranty for just $40. Another battery that may be compatible with your reciprocating saw would be Milwaukee brand’s 18 V lithium battery. These are designed specifically for cordless power tools and can be purchased in packs of two for around $80. The batteries typically attach to the bottom of the saw and if charged, will give your tool instantaneous power once attached. Having replacement holders, clamps and batteries are essential in keeping your saw in great condition, and this final product may help ensure this as well. Carbon brushes are used in power tools as a conductor of energy to keep the tool functioning. Sometimes, these brushes may require replacement due to the damage vibrations from the equipment piece and weather will cause. Replacement, as needed, will help extend the life of a reciprocating saw, enabling you to keep tackling all of your projects. The Makita Carbon Brush set is compatible with many reciprocating saw models, has high reviews, and in only $10 or less. Customers say Makita’s replacement kit is easy to install, making a necessary process an easy and painless one. Reciprocating saws are the perfect choice for any man or woman interested in home-improvement, D-I-Y crafts, or has a career in contracting or construction. The fact that they’re cordless gives them extra mobility and no need to worry or struggle with cords around the garage or job site. They are powerful, having the ability to cut through almost any surface. The customization of the saw gives you the freedom to install many different attachments and perform almost any task. Maintain your saw and keep yourself safe while using it and your investment in this power tool will last you many more projects.